Welcome Aboard our Wavepiercing Catamaran Quicksilver VIII on her daily trip to the Great Barrier Reef. To enhance your enjoyment of the day we have highlighted a few points about the day that are of particular interest to families. Your journey is as important as your destination. It’s a modern voyage, travelling in safety and air-conditioned comfort with state-of-the-art vessels that glide across the water to spacious (pram friendly) platforms floating at the reef’s edge. Walk into the underwater observatory, or cruise just above the corals in a semi-submersible. Your questions answered, your needs anticipated, your care assured, you’re free to enjoy the moment and savour the discoveries. From coaches, to cruises, to crew, it’s a day that’s all about you. Quicksilver offer special Outer Barrier Reef Cruise fares for families, please see our fares and prices page for current details. We do have a fold down baby changing table on Quicksilver VIII, however not on Quicksilver V. The change table is located in one of the toilets on the main deck aft of Quicksilver VIII. Please ask one of the crew to show you where to find it. Travelling to the Great Barrier Reef is a wonderful educational opportunity for children. On board our vessel we have qualified Marine Biologists who will happily answer any questions you or your children may have about this precious marine ecosystem. There is also a collection of illustrated reference books for your enjoyment and these are located next to the Marine Biologists at the front of the boat. . Please return them after use to allow others to enjoy these books as well. 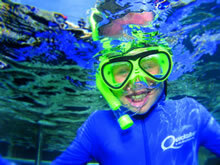 To assist children to obtain the best experience from their day at the Great Barrier Reef, snorkels, masks and fins are available in child sizes. These are located in storage bins at the top of the steps leading down to the snorkelling platform. Please make your selection before making your way down to the water. Should you require assistance then please don’t hesitate to ask one of our Snorkelling Safety Officers for help. There are various flotation aids available for your child’s use. These range from kick-boards to full flotation vests depending on your child’s swimming abilities. Accompanying adults may find that young children or non swimmers will tend to lean on them for reassurance when in the water. It is therefore recommended that the accompanying adult should also wear some form of flotation device to prevent them from becoming tired. Please check with the Snorkelling Safety Officer to ensure the correct fitting and use of the flotation aids before venturing into the water. Tip: If your child has their own swimming goggles at home, bring them along. We find most kids are more comfortable with goggles rather than a face mask, and love just 'flopping' around in the water with goggles and no snorkel. Please be aware of the harmful effect that the sun’s rays can have on your child’s unprotected skin. The wearing of a T-shirt and a hat, with the application of a 30+ sunblock on exposed skin is strongly recommended. To avoid eye irritation it is important to remove any sunscreen from around your child’s eyes when fitting their mask before snorkelling. Remember to reapply the sun screen regularly after in-water activities. The motion of a vessel at sea causes movement around a boat to be difficult and unstable. For this reason we must ask that access to the outside decks is restricted to children under the age of 14 unless they are accompanied by a responsible adult. If you have any other special needs, please do not hesitate to ask any of our crew for assistance. Our friendly crew will be only too happy to help if they can.